Outdoor Aluminium armchair with a Black polypropylene seat and back with decorative holes. Stackable to eight high and available from stock for an immediate delivery. Suitable for outdoor commercial use. 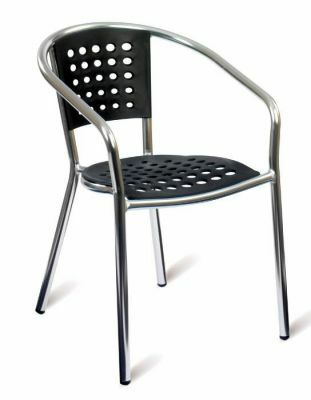 Aluminium bistro chairs with a black polypropylene decorative back and seat. Lightweight and suitable for outside commercial use. This chair also stacks for easy storage and mobility in large numbers.